The Northwest Angle, known simply as the Angle by locals, and coextensive with Angle Township, is a part of northern Lake of the Woods County, Minnesota, and is the only place in the United States outside Alaska that is north of the 49th parallel. That parallel is the northern boundary of the 48 contiguous states extending from the west coast along the northern boundaries of Washington, Idaho, Montana, North Dakota, and part of Minnesota to the Northwest Angle. The Angle is one of only four non-island locations in the 48 contiguous states not directly connected to them by land within the country, the others being nearby Elm Point, Minnesota; Point Roberts, Washington; and the town of Alburgh, Vermont. All four are located along the US-Canada border. Farther east, U.S. territory does not extend as far north as the 49th parallel. Map projections sometimes create a superficial appearance that Maine extends farther north than that; that appearance does not occur in maps in which parallels of latitude are straight lines. A portion (70%) of the Angle is held in trust by the Red Lake Indian Reservation (Ojibwa). Although the Angle is listed as one of several distinct regions of Minnesota, its total population was only 152 at the 2000 census. The Treaty of Paris, concluded between the United States and Great Britain at the end of the American Revolutionary War, stated that the boundary between U.S. territory and the British possessions to the north would run "...through the Lake of the Woods to the northwestern most point thereof, and from thence on a due west course to the river Mississippi..."
The parties did not suspect that the source of the Mississippi, Lake Itasca (then unknown to European explorers), was south of that point, and that thus the entire Mississippi was too far south to be intersected by a line running west from the Lake of the Woods. A factor in this mistake was the use of the Mitchell Map during the treaty negotiations; that map showed the Mississippi extending far to the north. In the Anglo-American Convention of 1818, the error was corrected by having the boundary run directly from the northwest point of the lake to the 49th parallel and then westward along it. 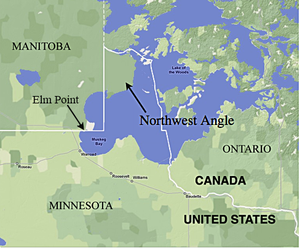 When a survey team led by David Thompson finally located the northwesternmost point of the lake and surveyed this north-south line, it was found to intersect other bays of the lake and therefore form the boundary of a section of U.S. territory to its east, now known as the Northwest Angle. One can reach the angle without crossing the international border by crossing the Lake of the Woods. This can be done by aircraft, by boat when the lake is free of ice, or by ice road in the winter. Since there are no automobile ferries currently operating on the lake, vehicles coming from the rest of Minnesota can reach the Angle without crossing the border only in winter. While the ice is forming in late autumn and breaking up in the spring the lake's surface cannot be crossed safely  at these times domestic access to the Angle is possible only by air. To reach the Angle over land, one would take Minnesota State Highway 313N (Warroad, Minnesota to Sprague, Manitoba) across the border into Manitoba, Canada, connecting to Provincial Road 12 in Manitoba at the border, then to Provincial Road 308 Manitoba, to Provincial Road 525, then finally crossing back into the United States in the Northwest Angle south of rural developed Angle Inlet, Minnesota (Angle Inlet Township). The distance from Warroad or Roseau to the Angle proper is approximately 63 miles through Minnesota and Manitoba back to the Angle's U.S. border. It is approximately 10 miles from the actual border (intersection of Manitoba #525 and NWA Road Dawson) to the rural developments of the Northwest Angle. The border crossing (image) is unstaffed. Travelers using the single gravel road in and out of the Angle are expected to use a telephone at Jim's Corner, Youngs Bay Marina or Carlsons Landing to contact Canadian or U.S. Customs and make their declarations. Because of laws restricting fishing, some residents of the Northwest Angle suggested leaving the United States and joining Canada in 1997. The following year, U.S. Representative Collin Peterson proposed a constitutional amendment that would allow the residents of the Northwest Angle, which is part of his district, to vote on seceding from the United States and joining Canada, angering the leaders of Red Lake Indian Reservation, which holds most of the Northwest Angle's land. This proposed Amendment was introduced to bring equity (under NAFTA) to alleged irregularities in the ways differing nationalities were treated on the Canadian portion of Lake of the Woods. US fishermen were not allowed to keep any gamefish caught in Ontario, unless they were actually staying at Canadian lodging facilities. This was later repealed by Ontario officials once a court action was initiated. Author Tim O'Brien popularized knowledge of the location with his bestselling novel In the Lake of the Woods, set in the Angle. The Northwest Angle was noted by host Brian Unger in the History Channel documentary How the States Got Their Shapes, as a "blip on the top of Minnesota that was the result of treaties long ago". Ernie Pyle, in his book Home Country, wrote several pages about the Northwest Angle and its residents. William Kent Krueger's 2011 novel Northwest Angle takes place in the area.